I did that last quick update when I went into work on Friday evening; with five minutes to spare before rushing off to a class, it was somehow easier to write like a breathless four year old. (The inspiration was in fact Sebastian's first composition, which I can recall verbatim to this day: 'Today we went to Beachy Head and I saw a dead badger and I enjoyed myself except for the dead badger'). Now back at home and the woodwork nearly complete, so I will now try to do it justice. The planks in the foreground of the photo in the last post are Chertsey's. 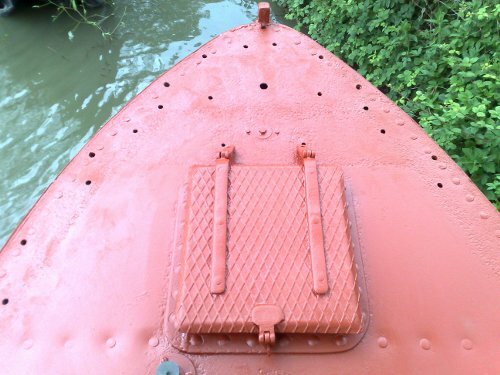 The narrower ones each became two sections of gunnel, and the wider ones were destined to become a front cant, and the wider gunnel sections towards the front of the boat. 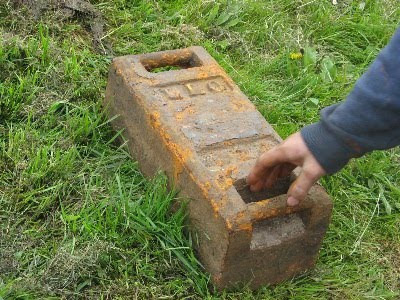 The gunnel pieces were sawn to shape and finished, then clamped in place so that the bolt holes could be marked. These were then drilled and recessed - a slight communications slip up here, as there were initially three options - to leave the bolt heads proud; to recess them and cover with oak plugs, which would add a lot to the cost, or to recess them more shallowly and fill with epoxy resin. I'd initially intended to go for option one, with option two as second choice; by the time the recesses were drilled, I was committed to option three. However, it will probably be for the best from a practical point of view; I am just not so sure how it will look. 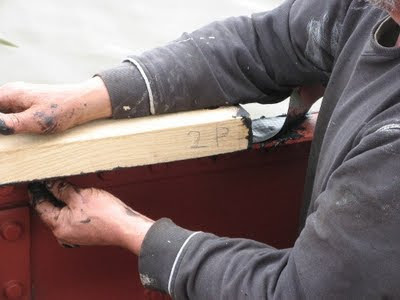 Once each section of oak was cut and drilled, we painted its underside and ends with bitumen. Then Jim spread a layer of bitumen mastic on the gunnel iron, and over the top of that, laid a strip of impermeable membrane. This is to provide a barrier between the oak, which will leach tannic acid, and the steel. The bolt holes were then punched through this, and the gunnel fixed in place with stainless steel bolts (and nuts and washers) - a total of 134 for the gunnels alone. 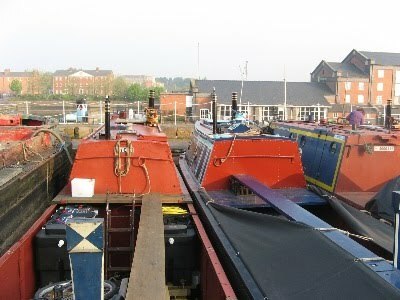 At the front, where the gunnel rises and widens, the rise is achieved through laying shaped pieces under the main gunnel, which is cut and shaped from wider planks. These are yet to go on. 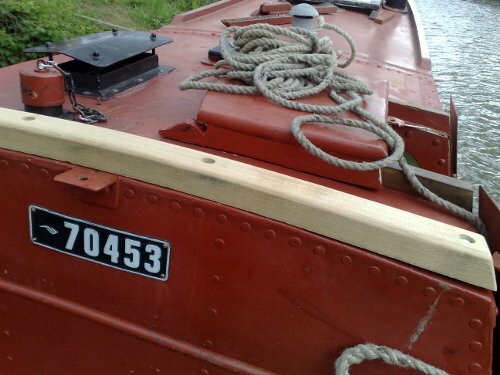 However, the handrails are all now in place, and the back end beam has finally - after a lot of struggling - assumed the curve of the cabin top. 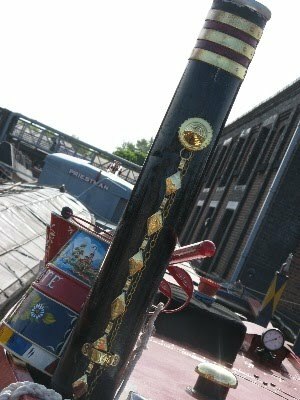 The front cants too are in place - one of the old ones was in perfect condition and has been reused - the only alteration has been to round off the end so that a rope is less likely to catch on it. This one is made of some sort of hard wood - probably mahogany - and we think is a replacement fitted in Richard Barnett's time. The other one, which was oak and quite rotten, was probably considerably older. A new one was cut to match and a new triangular piece for the middle to complete the shape. These were all bolted on into a bed of mastic, and the T-stud replaced. The deck beam is fundamentally sound and the damage around the bolt holes is going to be repaired. Today we went to a sawmill and I saw a big machine cut up trees into planks all on its own, only there was a man with a computer telling it what to do and we got the wood for Chertsey's gunnels and cants and on the way back we saw a great big hare and it was awesome. With apologies to Sebastian, aged three and a half. Having shamefully abandoned them for months (many, many months) I lent my labours once again to CCNA yesterday and took Tarporley out for a trip. I was particularly interested to see whether it steered as heavily as I remembered. In fact, it didn't. This may be because I've got tougher; it may be because they've straightened the rudder out (have they? ); but most likely because I insisted on using the new long tiller bar which, since they had the swans neck straightened (not completely, obviously, just enough), clears the cabin top with ease. It does not however so easily clear the bums of more generously proportioned steerers, hence its under-use. I also admired the new fridge, gasped at the new toilet, and bemoaned the fact that they'd got a new kettle and not given me the old one. Then I went to polish the brass trim on the ornamental water can and made a disastrous discovery - there was NO BRASSO. The shame of it. 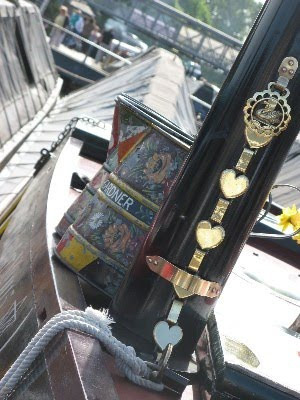 We were taking a hen party to Little Venice and then back to Camden where we dropped them off in the lock (no, not literally). I steered all the way back, and it did seem a lot easier - no doubt largely because I've had a lot more practice in the intervening months. Following Mike on Prince Regent I got round Cumberland Turn with no problem, and didn't bang or scrape anything all day. When we got back to Kings Place, I made the rather gruesome discovery that the shiny new toilet was blocked. I reported it to the skipper of the day (thankfully not me), who recorded it in the log book for the next day's skipper, who is by default, Toilet Officer (I was on the Toilet Subcommittee, but don't recall making any meaningful contribution). 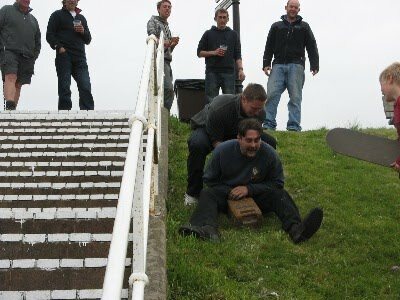 Later that evening he rang me to say that this is what comes of taking 'parties like that'. What, I said, women? Apparently, yes. Clearly my Toilet Talk requires refinement. Chertsey's new deck board is finished! Well, all bar the priming, rubbing and painting. A super job; thanks Jim. Unlike the old one, this one has a hardwood strip along the bottom, and it is finished with an angle to it, to take account of the fact that in position, the deck board tilts forwards. Unfortunately, we couldn't remember exactly how much - not that we'd actually measured the angle anyway. 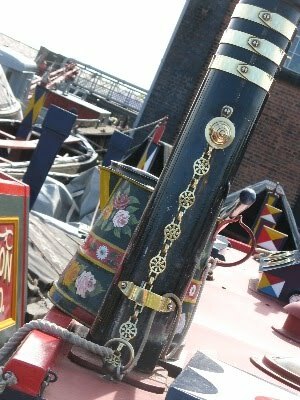 This is also taken account of in the cutting of the slots for the side pieces - which Blossom tells me are the bits rightly referred to as cratch boards, which I like. Jim has also completed the new false cratch, but my photo of it has come out so dreadfully that I can't show it to you. 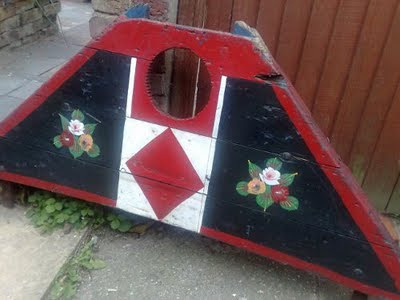 The false cratch is the A-shaped frame which is linked to the deck board by the cratch boards. The whole assembly is then the cratch. But where does the word come from? In horse boating days, the cratch was where the horse's fodder was kept. I've seen it suggested that 'cratch' is a corruption of the French 'creche', meaning crib or manger (originally of course, like its French counterpart, a place for putting hay etc. rather than a baby). Sounds plausible, except why would a French word have been used when there was a perfectly good English one? Maybe the word was already established as the name for part of a boat in France before somehow being transferred to English. On the Harland and Wolff drawing I've got, it's shown as 'crutch'; this I suspect is the draughtsman taking an unfamiliar word and hearing or reading it as a more familiar one. Lots of things on the drawings have different labels from what they were called by boatmen. Chertsey's deck board is 22" from top to bottom; originally they were specified as 27", but (George on Sandbach tells me) lower ones were introduced for boats working on the northwestern waterways because of the lower bridges. It's interesting that Chertsey's deck board (and false cratch) are stamped with its GU fleet number, 130, if as this suggests they're not the original ones. I wonder if they might date from as late as BW days, as they kept the same fleet numbers. I know it's been well looked after but reckon it's unlikely to be 75 years old! Ultimately though, I really have no idea. I've gone for keeping the lower profile - it will be helpful of course having that extra bit of clearance, but my main reason is that I just prefer the look of it; to me the big boats look better proportioned like that. An eloquent account, here, of the fatally corrupting influence of dabbling in old boats. 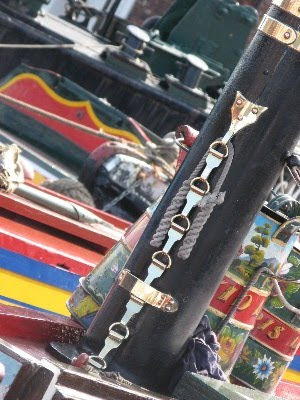 It might seem like a harmless day out, sunshine, beer, morris dancers, and ooh, a lovely backdrop of old boats. That's how we lure you in. Once you've taken that first whiff of old engine; that glimpse of fore end, before you know it the heady atmosphere has got you and you'll never be the same. But like some other addictions, as long as you can fund it, you can continue to live a relatively normal life. Sometimes you can even put on clean clothes and go to work, and for brief periods string together semi-coherent sentences that aren't about original GU vs. north-western deckboards, hot rivetting or sources of canvas fire hose. For a while, anyway. Sadly, the deckboard (which I think may be original or nearly so; it certainly has Chertsey's GU fleet number stamped on it), as well as being somewhat battered around the edges, also proves to have at least one rotten plank. The fact that it has survived this long is probably due to its having been stored off the boat in a shed for a few decades. Rather than keep using it until it falls apart completely, I've decided to have a new one made - and Jim has volunteered to make it! So we brought it home (again, along with the false cratch) on Sunday and this morning measured it up in order to get the wood to make a new one. These things are never simple are they. It's built from planks of tongue and groove, about seven inches wide, and 7/8" thick. The width doesn't really matter, as the planks are sliced off top and bottom as it it; more, narrower ones will probably look better. But the thickness is a bit of a problem; modern standard thicknesses seem to be either too thin (20mm) or too thick (38mm). 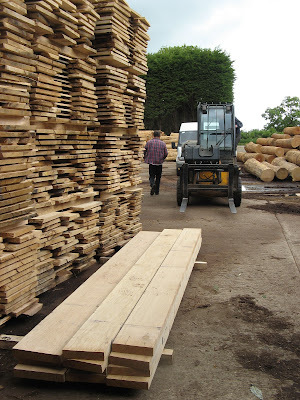 These thicknesses, as I have enjoyed learning (not today; I did already know) are not the actual thickness of the wood you buy, oh no; they are the nominal thickness of what it was before it was planed. A bit like Whitworth bolts, I suppose. So the 20mm is something less that 3/4" and the 38mm is about an inch or a little bit more. 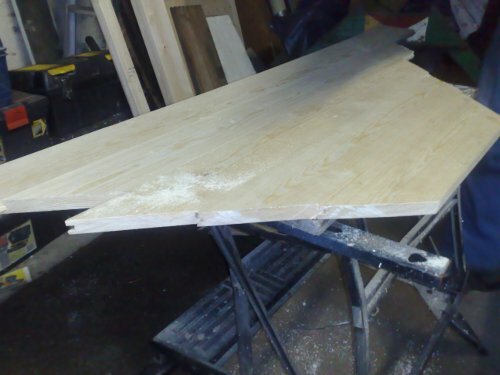 The overall thickness of the deckboard is actually formed of three pieces of wood, so using the thinner T&G but the thicker wood for the framing, overall it should come out about right. We went to Wenban Smith in Lewes for the wood, and not only was the service excellent - very helpful and friendly - the wood is very good quality as well. The new one won't feature the hole carefully drilled out for, presumably, the headlight. 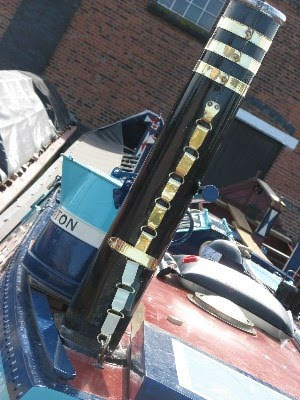 We had a short but very productive weekend in Braunston. I chronicled every stage in photographs - and then left the camera on the boat. So instead we have a grand total of the three photos which I took with my phone. We are in Braunston to get some woodwork done. 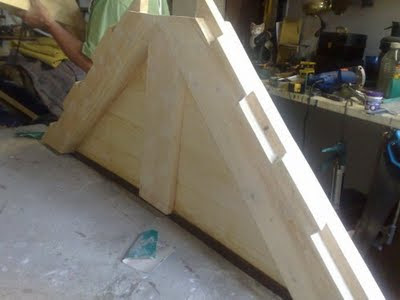 Gunnels, handrails, front cants, and back end beam, I think the total will be. We arrived on Friday and set about removing the old wood from the foredeck - there were already cants in place, plus the breast piece that had bees nesting in it, and handrails which were so rotten the rain was running through them; the back end beam we removed last year as it was totally rotten, and the gunnels have always been conspicuous by their absence. 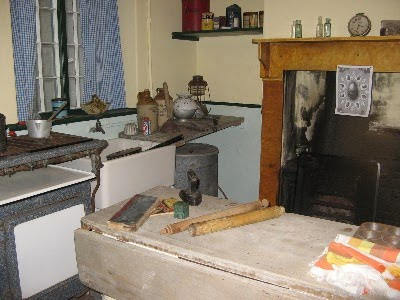 Naturally we (especially Jim; que sera sera being my middle name, ha) were concerned as to what lacework, rust etc we might find beneath - the answer was none; all the steel was very sound. Hurrah! Jim had come armed to lever ('horse' in his terminology) off the wood but with the exception of the breastpiece even that proved too sound and I was afraid of damaging the steel if we were too violent. So we got the ladder and lowered it through the foredeck hatch, and Jim lowered himself down it. I wish I had that photo. He set about the nuts holding the wood on without much hope, but found them to have been greased on installation forty-odd years ago, and with the exception of one, whose bolt was turning in a rotten bit of wood, they all undid. Better still, one of the cants is made of some sort of hardwood that was still in excellent condition, and with a little reshaping, will be reused. 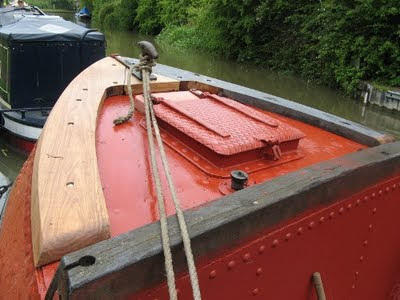 the handrails, complete with a drip at last over the starboard engine room doors, were made, and on Jims part, all the old wood was removed and the steel beneath cleaned and painted. Today the oak for the gunnels is being ordered; the handrails might have been fitted in our absence if the rain eased off, and a nice piece being selected for the new cant. We return a week on Thursday to continue the job. Very very impressed so far. Here we are topping up the diesel from Liam in Middlewich. We'd passed him that morning, but hadn't had enough cash on us, so he said he'd catch us up in Middlewich. He arrived about an hour after us - having left an hour after us, served three customers and made a detour along the way. When he arrived, I was washing my hair, again - last time Ariel passed when I was doing that at Kings Bromley, Liam videoing the whole thing. 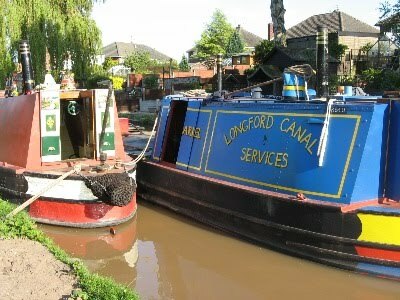 It's nice now knowing a few fuel boats and buying from them - a couple of bags of coal from Alton at the Port too. I used to be too shy to ask and too nervous to seek them out, but now I actually know the people it's great. So far Chertsey has had diesel from Towcester, and Turners at Wheaton Aston as well as from Ariel. We've not got a properly calibrated dipstick (and didn't think to make one when we were starting from an empty tank, d'oh) but Jim has calculated usage at between one and one and a quarter litres an hour. We've never filled the tanks right up and I don't think are ever likely to! I've forgotten what the capacity is, but 'massive' just about covers it. This was one of those posts which I started without having any idea what I was goinmg to say - does it show? 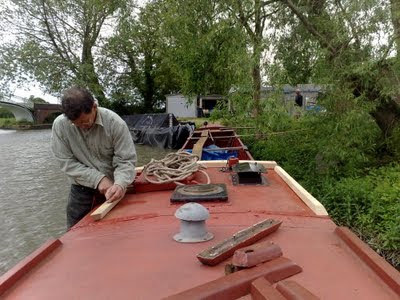 Tomorrow we are driving up to Braunston where hopefully work will soon commence on the gunnels, fore end cants and other bits of woodwork, so there will be some restoration blog stuff to read again soon! 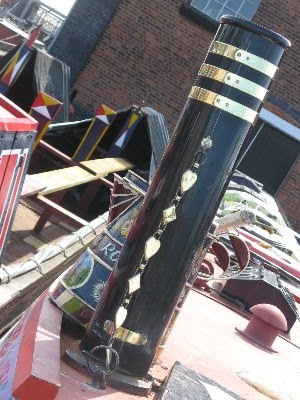 An extravaganza of chimney chains and chimneys for your delectation. The dedicated blogger never fails to photograph a meal if there's the slightest chance it might be of interest. 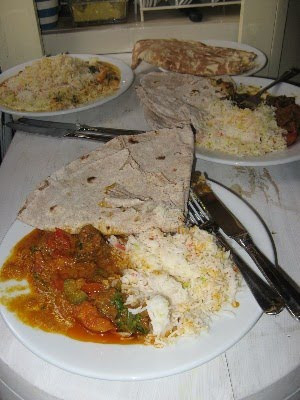 Here is the Indian takeaway we had from the Goa restaurant in Ellesmere Port, when we were entertaining John-from-our-mooring. It was very nice, and not at all expensive. 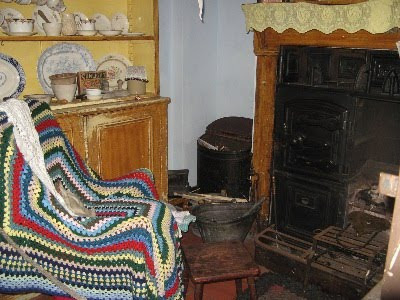 I remember the first time I went into a preserved cottage, at a mining museum in Wales - also the first time I saw a rag rug - and I've loved them ever since. I never go to the Ellesmere Port museum without spending some time in the 'Porters Row' cottages, and over the Easter weekend it was lovely to be able to wander in and out at times when there weren't too many other people around. What is it with me, that I really, really, want to move in? 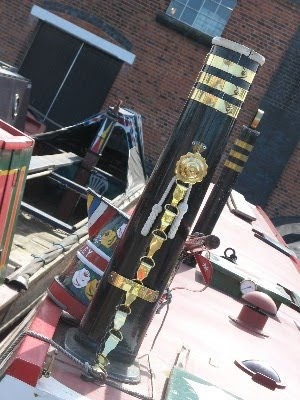 Along with Chertsey, I acquired two gauging weights. 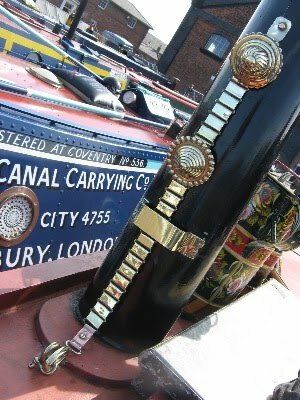 One is from the Grand Junction Canal, a catroon weight shape with a ring in the top, and I fully intend to hang onto it. 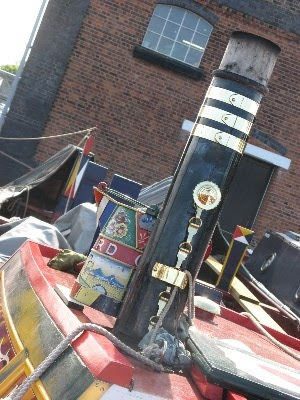 The other was from the Leeds and Liverpool Canal, and I wondered whether the L&L society might like it back. So ages ago, I emailed Mike Clarke of that organisation, and he said yes please, it would be good to put it on Kennet. How could we arrange to transfer it... 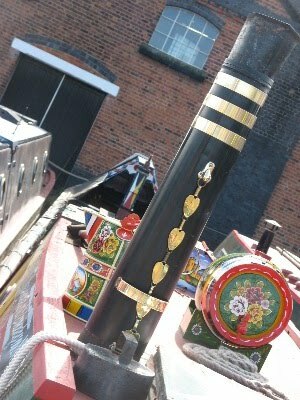 He mentioned that he would be at Ellesmere Port and I guess I thought that he was thinking of transferring it to a motor vehicle. However, when we tracked him down, he had other ideas. 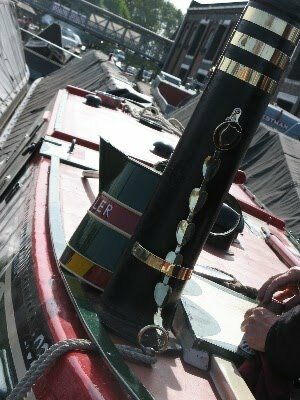 If we could get it out of the hold, he suggested, perhaps we could put it on one of the narrowboats that was planning to make the Mersey crossing to the Liverpool Waterfront Festival, and they could pick it up from there. 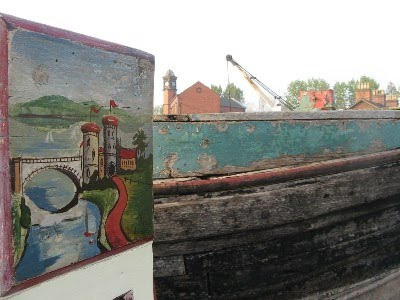 I knew though that Severn, another Leeds and Liverpool short boat was also going to Liverpool, and it seemed much more appropriate for the weight to travel that way. Furthermore, I knew that Severn was possessed of a young, robust and sufficiently mad crew to undertake the project of transferring the weight - which we took a wild guess at being about 2 cwt - from the 4'8" depths of Chertsey's hold, down to the lower basin, and on to Severn. So I sought out Rick, Barny et al, and threw down the challenge, which they immediately picked up and leapt into action. Barny and Sam got it out of the hold; another chap whose name I never got found a rather unothodox way of lowering it down the slope, and when we left, it was sitting on the bank next to Severn. Now you didn't leave it behind, did you boys? Some choice cuts from the Port, from April 22nd. Meanwhile, we have arrived home and Jim is emitting the traditional cries of anguish as he goes through his 700 emails and sees what he's missed on Freecycle - this time, a wringer, just like he promised me for my birthday! Not much to say about this epic day really, we just got down and got on with it. Nothing terrible happened but we got stuck on the bottom -or, more accurately, on lumps of stuff on the bottom - a few times. This was the worst I've known for actually feeling the lumps beneath the boat and hearing the shopping trolleys, bikes etc. dinging and scraping along underneath. Along one stretch a couple of boys with a home made grappling hook had hauled out loads of bikes and stuff. Good entertainment for them and certainly better than sitting in front of the computer, but no doubt it will be someone else's entertainment to throw it all back in again before long. This is one of the few stretched we have previously done in Chertsey, and I'm sure it's worse than last year even though there seems to be more water. I really begin to understand the expression 'the bottom's too near the top' - the top after all is the same all along the pound; it's the bottom that varies. Anyway, we made it to the Greyhound and hopefully tonight should see us in Braunston. Once again I was too busy enjoying myself, and then (not entirely unconnected) too tired to post yesterday. We thought Stone to Rugeley would be a fairly easy day's boating, so we didn't leave until late, first strolling around the town, checking out the charity shops, and breakfasting on Staffordshire oatcakes with bacon (and bacon and cheese for Jim) from the market, which was a nice treat. The oatcake itself, with all respect to a local delicacy, is not a lot to write home about, being rather like eating hot wet cardboard, but when wrapped around a bit of decent bacon does make an excellent breakfast. I forgot to mention too that we had some very nice chips from the shop in Stone on Friday night too - and I say that as someone who's very fussy about chips. They were fresh and not at all greasy or soggy. I also bought a fridge thermometer to test the various milk storage options, and I am very happy to report that the sidebed is the perfect temperature for storing beer and will henceforth be known as the cellar. Still working on the milk, but at least the important things are right. The easy run turned out to be a bit of an effort in the end as we were constantly batttling the wind (likewise today) which does make it all rather harder work, but we did eventually make it to Rugeley as planned to meet up with Blossom and Dawn at the Ash Tree - never been there before but having been to the Boat (?) at Braunston was immediately familiar with the concept - a Marstons family eatery, and not at all bad for all that. I had three pints of Pedigree (and you wonder why I wasn't blogging at midnight) and salmon hollandaise, but best was my starter of goats cheese and black pudding which I would definitely have again. What made the day though happened as I was walking down towards Haywood Lock. Suddenly I stopped and did a double take: Pendorric. 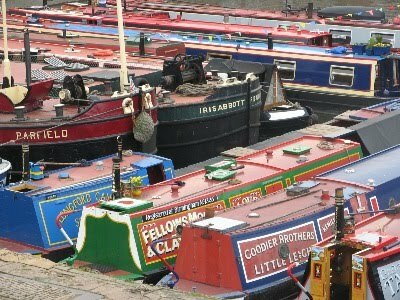 (Search the Warrior blog if you don't know the story...) I thought I should explain the fact that I was standing there with my mouth hanging open, so I told the owners 'this was the first boat I ever fell in love with'... and he replied, 'Have you got the Warrior blog?' (Not as spooky as it seemed at first, as he'd found it when Googling for information about Pendorric.). They were lovely people, who'd bought the boat only a week ago and brought it back from the Ashby where it spent the last six years to their mooring at Armitage, and they insisted on me coming inside and having a look. It was as beautiful as ever and in much better shape than when we looked at it at Whilton in 2005 or 2006. And so on to today - again, we didn't exactly get off to an early start, and, again, the wind didn't make things easy for us, but we coped; we must be getting a lot better at this boatting lark. Nothing really exciting happened today, except the Nicholsons Book 3 blew into the Coventry Canal, so we are now on a Mystery Tour. It was zipped in a plastic folder, so might actually survive its immersion and drift up on some foreign shore... I wonder if someone will find it and read that it is inscribed 'Chertsey 2010' and it will find its way back to us... Stranger things have happened (v.s.). In the meantime we are going by memory. The ziplock folders by the way are jolly good for putting your Nicholsons in; not only do they keep the rain and the smuts off, but they keep it flat and stop the pages blowing about, and it takes a really strong gust to blow the whole thing away! It is possible too to turn the pages without taking it out. Tonight we are not oing to the pub and tomorrow we really will have an early start. 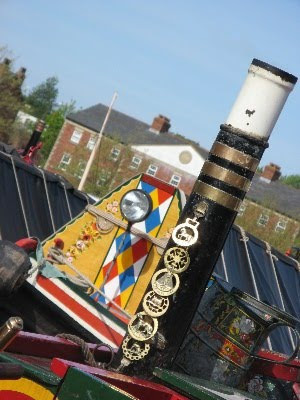 Hoping to be in Braunston by Wednesday at the latest as I need to be at work on Thursday. All good things must come to an end I guess.